The Virginia Horse Center stands at the forefront of Virginia’s $1.2B equine economy. Founded to promote all disciplines of equestrian sport, its 600 acres of picturesque grounds hold a 4,000 seat coliseum, eight barns to accommodate 1,200 horses, 19 show rings. 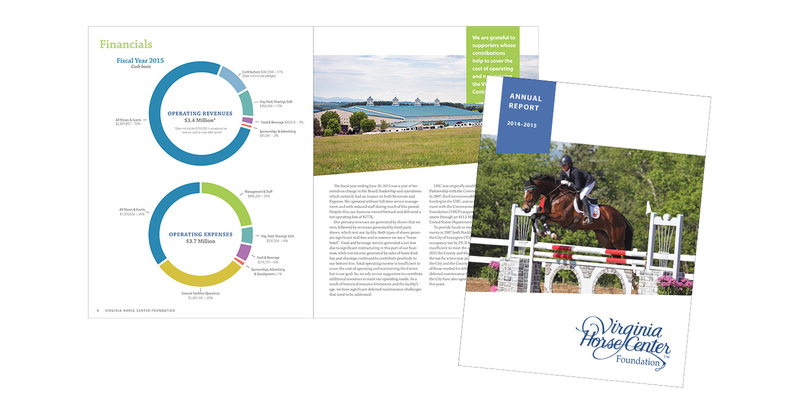 m.design has been privileged of designing and overseeing print production of beautiful annual reports that report on events at, improvements to and plans for the VHC. I credit the amazing photography provide by many professional equine photographers for the quality of these reports.